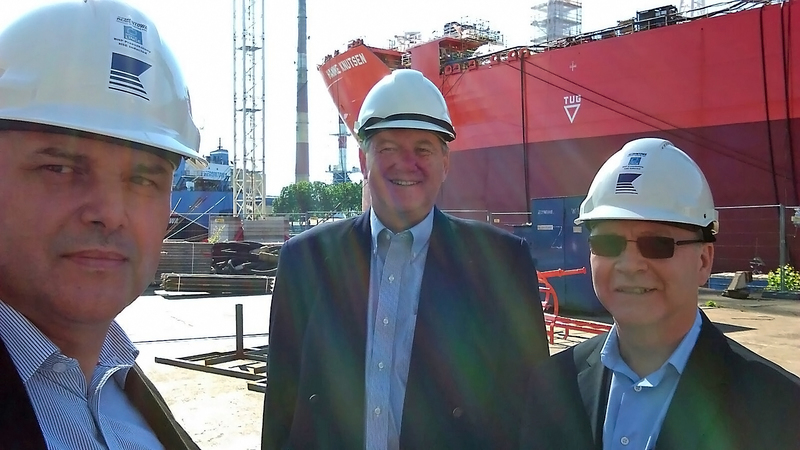 ICE senior managers last month visited Baltic shipyards, including in Gdansk, Poland, where the ICE-designed conversion of a shuttle tanker into a sophisticated FSO is under way. ICE is pleased to recently have been entrusted with providing additional technical services for this high profile project. The design complies with the requirements of a major international oil company as well as the regulations of the Norwegian Petroleum Safety Agency (PSA) and NORSOK rules. Pictured are (from the left): Sorin Brazdis,(ICE Project Manager), Steinar Draegebo (ICE Chairman & CEO) and Robert Swan (ICE President & COO).